The word 'SHENSHA' comes from the old Persian language, meaning 'The Great King'. We have been open for the past 21 years and have built-up a regular clientele. Our curries are not made with curry powder, but are uniquely created using many different kinds of spices, with most of the herbs and spices prepared and ground on the premises. We purchase spices individually and mix them ourselves to create the best taste - we claim to be the best in the area - try us and let us know if we really are! Our curries are not made with curry powder, we use many different kinds of spices, most of which are made on the premises. We only use the best - and you will notice the difference! Many people think 'Curry' is naturally a hot dish - but this is a mistake. 'Curries' can be created to different degrees of hotness and taste. You may like it medium, hot, very hot or mild, in fact, you can have it exactly how you like it - you only have to ask. Our business is based on regular customers. You can only keep regulars by consistently serving the best food. You will find some of the dishes we serve are unique to our menu. 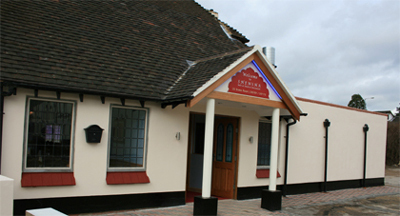 Many of our Special Dishes are prepared using spices specially imported from the Indian sub-continent. If you require our lunch time service during the week, we are more than happy to fulfill your request, as long as you have pre-booked. Pre-book your lunch time service by emailing your requests to info@shensha.co.uk or alternatively call us on: 01296 393781/397772. We are based on the Gyratory system with ample parking to the rear of the restaurant.